Although I have covered some of this, I just love fresh pasta so much that I had to share it again! I will admit, making fresh pasta is a blast! It is a great skill, but it takes a little patience. So, we talked about making the pasta dough in “Perfectly Practical Pasta Fundamentals” or click on the link http://patrickstable.blogspot.com/2015/06/perfectly-practical-pasta-fundamentals.html to review. Okay, ready to go? Let’s make some pasta! For me there are 3 styles of pasta that can be used universally. Those are fettuccine, spaghetti, and ravioli. The great news is that if you are rolling these by hand, the dough will be same thickness for all three applications. I will say that without a pasta attachment for a stand mixer or purchasing a hand crank pasta maker, no matter how much you work the dough with a rolling pin you will only get to about an 1/8 of inch thick. From my own experience and after numerous tests, I was only able to get the dough to about that thickness. Seemed like when I did manage to roll the dough thinner, the dough would ultimately retain it’s shape. It felt like it was something out of horror film or a science project, which this sort of is, but we want that that bounce in the pasta because that means it will have that springy texture when you bite into the noodles. 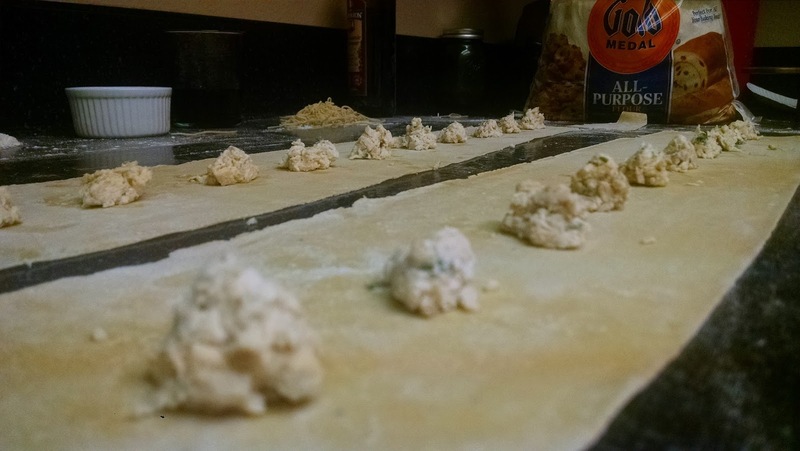 The good news is the even when rolled by hand, the dough is thin enough for us to make homemade pasta! Now, if you invest in the hand-crank roller or mixer attachment it will make rolling the pasta a breeze. Just follow the instructions of your roller to get to the correct thickness for your pasta of your choice. I have been making a ton of pasta dough ever since learning how to do so in a local culinary workshop, and I have been using it in practically any form I can come up with. The truth is that once you have the basic dough down, you can do anything you want — once your dough is as thin as you want it (or you can get it), then it is up to you to do what you want with it. As I have said, the cooking times will be impacted by the thickness of your pasta dough. So how do you cut the pasta to get the shapes you want for spaghetti and fettuccine? Fold your sheets of pasta until they form this general ribbon shape. After that, it is just a matter of cutting the pasta. If you want spaghetti, cut thin ribbons with a knife. Sadly I don’t have any photos of this. I know, shocking right? Just use your best judgment and go with any width you like. 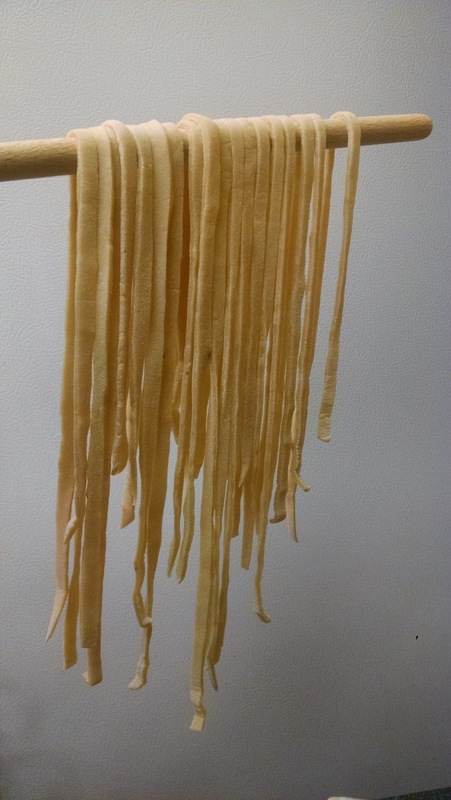 Honestly, you can use some dried pasta as a cutting guide if you really want to get serious about it. I just eyeballed mine and it worked out just fine. 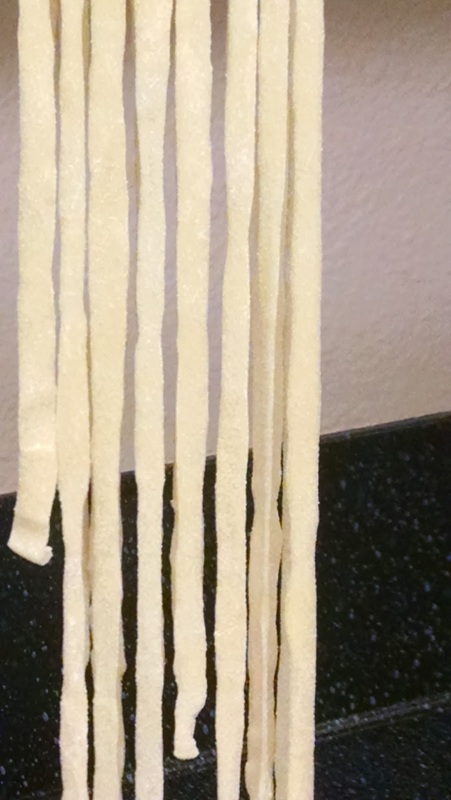 If you want fettuccine, cut the pasta into slightly thicker ribbons until you have something that looks like this. Make sure to dust and roll the pasta in a little flour to keep the strands from sticking together and they will be easier to handle that way. 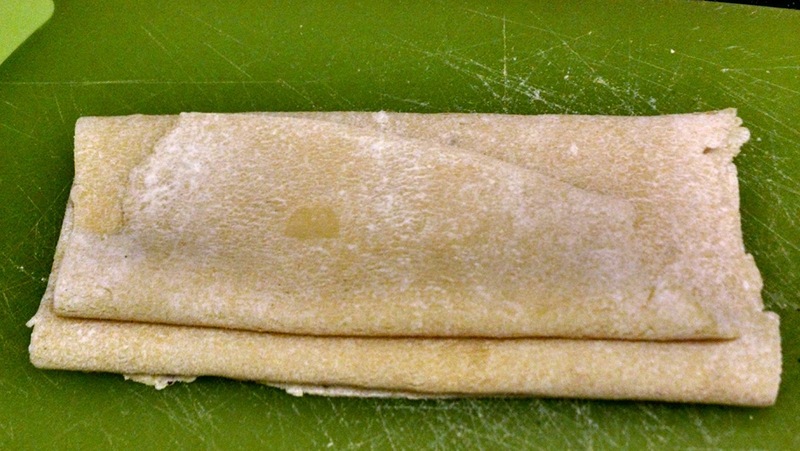 For ravioli, keep your pasta sheets whole and try to make them as even as possible. If they aren’t perfect, don’t worry. You will be able to trim the sheets once the raviolis are formed and ready for their salt water soak. Next, use a small spoon or a measuring spoon and scoop out a couple of teaspoons of filling for your ravioli, dropping the filling onto a pasta sheet. Leave a few inches in between each lump of filling in order to make sure you have enough dough to seal the raviolis properly. Here are a few photos to help you get an idea of what to do during this process. Finally, use a little water and brush the edges of the sheet of dough and in between each bit of filling. Then, fold the top half of the sheet over the bottom and press with your fingers around each area that you dabbed with water — this will seal the ravioli. You could also use another sheet of pasta and cover it like you would with a pie for example. Trim your ravioli accordingly, and if you want, you can crimp the edges with a fork to make sure they are sealed properly. The only thing left to do is test your ravioli to see how long they will need to cook. I would recommend testing a couple of ravioli in a pot of boiling salt water. After that, apply sauce and enjoy thusly. If you need some sauce suggestions, may I recommend some lemon cream sauce or some turkey bolognese sauce. I believe you find these very suitable for your intents and purposes. Congratulations! Throw some flour in the air! You have graduated from Homemade Pasta 101!! Yahoo!!! I hope this inspires you to make homemade pasta! Leave me feedback or questions if you want to try to tackle something else pasta related. Oh, for all my friends that have gluten sensitivities, I haven’t forgotten about you either. I am currently testing a gluten-free pasta recipe that I hope to share in the near future.